Please don't look at my Twitter page for the next hour because I shall be swearing like a trooper as I try and get on the Swearing on Twitter Map. This real-time map animates through Twitter massages that include swearing (believe me there are a lot of them). The map was created by prolific Google Mapper Virender Ajmani. 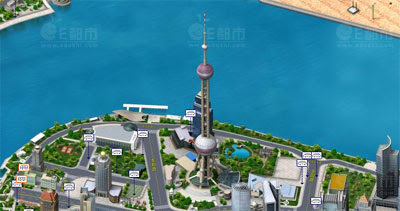 Edushi.com have produced isometric 3D maps for 21 major cities in China and the majority of the provincial areas. The maps look simply stunning and are great fun to play with. Both of these maps I found via the ever impressive Digital Urban. Street View in Canada Soon? According to the National Post Google will launch Street View in Canada in a 'few weeks'. This story should not be in a 'fun' post (but hopefully it will get noticed more here). Channel Four have put together a series of before and after shots of the Italian earthquake using Street View imagery of L'Aquila, which were taken before the devasting earthquake that struck this week. 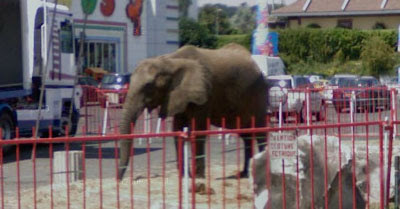 I bet that just about now you would really like to see a Street View of an elephant. Who wouldn't?